Celtic, British. Trinovantes. 1st century BC. Cast Potin. Thurrock type. Tribe : Trinovantes. Date : mid 1st century BC. Reference : VA-1404-1. Spink 62 variety. Size : 16.5 x 17.2 mm. Weight : 3.32 grams. Grade : VF/F but a few corrosion spots. Reverse : Bull butting left. This type is known as the Thurrock type because a lot of them were found in the West Thurrock hoard. 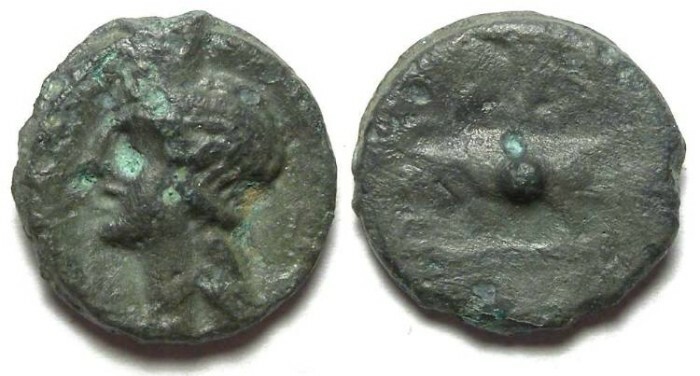 This coin came to me with a notation that it was from that hoard.